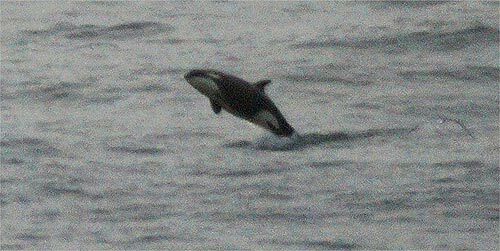 (Oregon Coast) – UPDATED: NEW OBSERVATIONS OF DIFFERENT WHALE GROUPS. 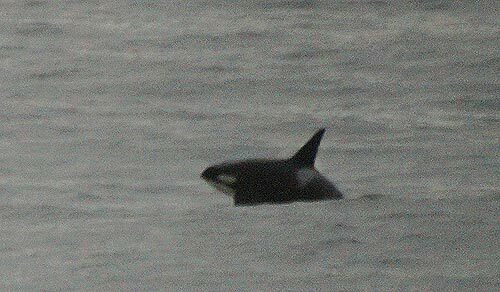 A nice run of Orca sightings has much of the Oregon coast abuzz lately, with on and off sightings since March and more than usual up around the Columbia River in recent days. There are some spectacular encounters, including some jumping out of the water, doing what's called a spyhop. The Facebook group Clatsop & Pacific County Whale Sightings has been lighting up with those who have spotted killer whales around the Wreck of Peter Iredale and around the Columbia River in Astoria. They’re being seen farther east on that river than usual as well. Tiffany Boothe of Seaside Aquarium was one witness. In the Depoe Bay area, the Whale Watch Center’s Luke Parsons said they’ve been seeing them around the central coast as well. They’ve spotted a few at the Whale Watch Center – not many – in that area, but there have been heavy reports from other community members, Parsons said. Still, the center caught some amazing video of them back on March 2 as well some stellar photos, including this one above. Some of the Seattle-area pods showed up in March as well. Another amazing encounter was video of a handful of killer whales entering Tillamook Bay on April 19. Tim Roach, who took the video, said he also spotted some jumping around. Indeed his video shows some magnificent moments as a pair of them surface quickly and they continue racing around these waters. What’s interesting is that you’re getting at least two different groups of whales along these shores at the moment. The Seattle residents made and appearance, and transient pods are what’s hitting the Columbia River now, which was that same group that Parsons and the Whale Watch Center crew had taken on video in March. This is the group of killer whales normally loitering around the central coast – this rather mysterious population that drifts through this time of year in search of baby gray whales to make a meal out of, as well as other kinds of creatures. The Seattle pods are more interested in something else, and it’s just a coincidence they’re showing up when the transient groups are. 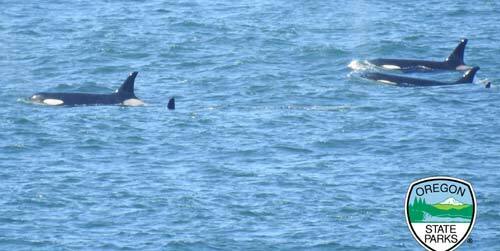 They have been identified on the central coast in recent weeks, but the group sometimes being seen there right now could be a different bunch of transients altogether. 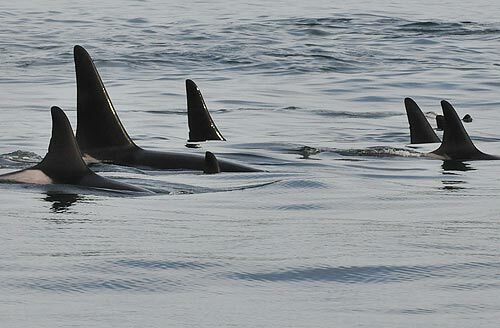 The transients – which often have a more beaked appearance than regular Orcas – are a big mystery still. No one knows where they come from, and while there is a lot of research being attempted on them, there are many groups of these and not much has been discovered about them.